We Have A New House!! It took every thing in me to hold back on sharing but we finally have the keys and now I can officially share our exciting news: we’ve moved! While on our road trip this spring/summer, we were actively looking for listings in a couple of different cities in the Seattle area. We knew we wanted a little bit of property. We hoped for a home that had good bones, but needed some cosmetic updating. We dreamed of a place with a big studio for us to work from home in. Our hope was to buy something toward the end of our trip so that we could get the kids into their new schools at the beginning of the school year. By mid-August, we had pretty much given up hope of finding anything that fit our criteria (in our price range!). While driving to our last overnight stop, a new listing popped up. Property? Check. Lots of grass and trees for climbing, fort-building, outdoor adventuring for the kids and dog. 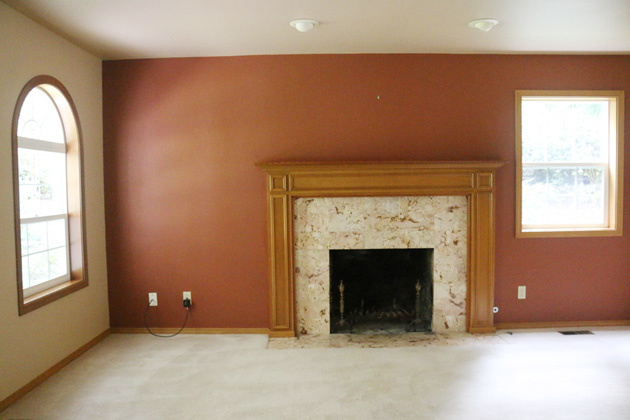 Home in good shape but in need of a little updating? Yep. Totally livable as is, but with so much potential. Extra Studio space? Surprise! 900 sq feet of unfinished space above the garage. It was located in one of our favorite Pacific Northwest towns, Gig Harbor, where the schools are great, community is established and thriving, there are restaurants and shopping and it is surrounded by the gorgeous waters of the Puget Sound. The only problem was that we were miles and miles away in eastern Oregon with 10 days left on our road trip and no option of cutting things early to visit the home. So we kept on with our plans, finishing off our trip with a week-long extended family vacation, secretly praying that no one would purchase the house before us. On a Sunday, we arrived home after 4 months on the road. On Monday we looked at the house. On Tuesday we bought it. Wednesday was spent enrolling the kids in a new school district, Thursday they met their teachers and they started school the following week. It was a whirlwind! This new home is 45 minutes from our old house and for about a week we commuted the kids to their new schools before we decided we needed to stay closer. Our long-time friends graciously offered their apartment over their garage to us, and so for the past six weeks, we’ve been living in Gig Harbor, getting acquainted with the area, settling into new schools and working from coffee shops. It’s actually been a really nice way to transition. We were supposed to close on the house at the end of September, but the closing kept getting pushed out and out until finally we got the keys on Friday! Here’s the photo from the listing. The one above was taken this weekend during a break in our stormy weather. The one below was from this summer. It’s a darling, slightly confused mix of traditional/cottage/craftsman home built in 1992. The previous owners built the home and raised their family here and we can’t wait to enjoy what they’ve created. A view from the walkway to the front door. I like this side of the house. The garage is large enough for us to park our cars in (we couldn’t fit our big cars in our previous garage!) and has a huge unfinished space above. The back of the house is cute, too. The fence was used to keep the previous owners’ small dogs contained, but our dog would knock that thing right over, so it will come down soon to let the lawn be one expansive space. The yard and trees are so pretty. We love that even though there are homes nearby, you can’t see any of them from the house. It feels private and green and perfect for the kids. The house has a very typical builder-grade layout. To the right of the entry is an office; to the left is a living room. Straight ahead are stairs going up. The living room looks out onto the front porch, has a wood-burning fireplace and connects to the dining room. At the back of the house is the kitchen and eating space (you can see how the rooms connect – the oval window is the front door). It was probably remodeled within the last five-ish years with new tile floors, granite tile countertops and nice appliances. The windows and french doors look out over the back yard and lead to a patio. Off the kitchen is a family room with vaulted ceilings. Here’s a good shot of how the rooms connect. Through the door on the right is the mudroom and laundry room which leads to the garage. Upstairs are three bedrooms and a third floor bonus space that we’ll be walling off to create a fourth bedroom for our oldest. The Master bedroom looks out over the back yard and has such pretty windows. The bathroom has been updated (probably when the kitchen was redone) and has fancy things like radiant floors and four shower heads. It leads to a good-sized walk-in closet with a window. Weirdly, I really wanted a window in our closet that could let in fresh air. The two bedrooms on the second floor are nearly identical and have a dormer window flanked by two large closets. Audrey’s room is above and the two middle boys will share the one below. They are especially excited about turning one of the closets into a lego room. Between the two rooms is a bathroom. … which boasts this large bonus space. We’ll use half of this room as a bedroom and the other half as a play room. The kids are nearly done with toys, so it will probably be more of a ‘hang out’ space, possibly with a pull-out couch for guests. As I mentioned, there is a big room above the garage that is unfinished with two dormers and lots of natural light. It is going to make the perfect studio space for us to work from. I truly can’t wait for this room to come together. Ryan and I work from home and our small office was feeling cramped. This space will allow us to spread out, have a dedicated place for recording coffee chats, meeting with clients, leaving out projects and then closing the door and walking inside to leave work behind. Our little design business is growing and it feels like such a treat to have this space to be inspired and creative in. So that’s our new house! It is everything we were hoping for and has our creative wheels spinning hard. We can’t wait to add our style to every part of it. Most of all, we are so excited to make memories, invite friends in, host parties, use the yard, swing on the front porch, climb the trees and allow this new home to be the backdrop to this new season of life. Get ready for lots of inspiration posts, design boards, big and little projects. It will be fun! Ooh. HGTV dream house is in your town this year! How fun! I thought I recognized the name Gig Harbor when I read it. So fun! Hope it’s all you dream of and more. It’s the family that makes it a home and you have the prefect beautiful family to make it a fabulous home. When do you move in?? What a gorgeous house! I love that there is so much room to make it your own. My friend told me to check out your blog because we are in the process of buying a house and the way I am talking about it reminds her of your blog. I keep telling her things like “I want to make a few changes and bump it up from builder-grade-blah.” and “Its livable as-is but needs some style.” I look forward to sifting through your blog and hopefully getting some inspiration as I transform my own new-to-me home. welcome! We feel just the same about our house – room to bump it up from builder-grade blah! Congratulations! I can hardly wait to see the transformation with your special flair and touch. Beautiful home! It resembles my home in Colorado. I have a wrap around porch and just love it, trying to make cute seating arrangements all around is a challenge though. I just recently found your Blog and am so happy that I did:) Your very inspirational and down to earth. I am a fellow Home Décor blogger and am always excited when I find other creative women to relate to. I wish we could have coffee together on our porches and chat about decorating and life. I love your coffee chats and hope you do more of them. Anyway, so nice to meet you Emily:) Can’t wait to see what you do with your new home. Enjoy! Wow! How did I miss this post?!?!?! Love, love the new house and I can’t wait to see what you guys do with it to make it your own. So exciting! That yard is amazing and I bet it just keeps getting better and better as the Autumn colors peak. Oh, and I love your coffee chats! If we ever make it to the Seattle area I would love to get together and have coffee in person. :-) You are so inspiring and your obvious joy for life and sweet spirit make your blog one of my absolute favorites! I so look forward to each new post. So, thank you for sharing your heart and life! Thank you Hannah! Your kind words mean a lot! Congratulations! Your new house is so lovely. Love the grey colour! Hope your old house sells quickly & all goes smoothly. What a busy but exciting year 2016 has been for you all. Have you been “introduced” to Mavis at One Hundred Dollars a Month? She’s close to, if not in, Gig Harbor, she talks about it all the time. She’s a hoot and I’m sure is a great tour guide. Love the new property, can’t wait to see what you do with it! I am so overjoyed for you and the family! I got so excited to hear you’re in Gig Harbor now, as I grew up there, and loved it! I can’t wait to see all your transformations! What a fun adventure!! God Bless ? Such a beautiful home to work with. I’m excited to see how you tweak it for your family! I can NOT wait to see what you do with this! How exciting!! Such exciting news! The house is stunning, lovely yard too. Wondering how this transition is for the kids, I can imagine it wasn’t easy to be pulled out of school 7 weeks early and not return to your friends and familiar scenery. Would love to know how it’s going! Love looking at your new house and will be excited to see how you decorate. You have such a cute family. Love the pic of the 4 kids on the porch swing! Enjoy! I can’t wait to see what you do with it all… I way already eyeing what walls I would take down for you! Will you paint the kitchen cabinets? LOVE the landscaping, so nice an lush makes me jealous as living here in the mountains doesn’t always afford us that kind of lush landscaping. Congratulations! You and your family are indeed blessed to have such a wonderful new home to live in. Thoroughly enjoyed your commentary on each room and how they get connected. You are too good… All the very best … and psst… do say a prayer for all those who used this place before you shift in! What a lovely home. Your children are a wonderful age to start this new adventure. Happy for you. Thw pictures are fantastic – but what you are showing us is over-the-top perfect. So glad you were able to make it your home. A blank canvas is ideal, especially since there are neutral walls. I will eagerly watch how you make it your own. We just closed on Friday on a home in Port Ludlow after getting our offer accepted on August 15! It’s crazy out there. Our appraisal took almost 60 days! Your new home is so darling! We looked at Gig Harbor as well when we were searching; it’s a great community! Sidenote: I highly recommend the Gig Harbor Peninsula Civic Orchestra! My good friend played in it for many years and we loved to journey out there for the evening. Their winter concert is Dec 17. Free admission! Congratulations on your new home — it’s beautiful! By the way, did you happen to notice on the picture view – “a view from the walkway to the front door. I like this side of the house” — the shape of a heart formed from the trees? It was meant to be! It’s beautiful as is, so many great features. Can’t wait to see what you will do to make it your own. It will be exciting to watch!!! What a beautiful home and a well established garden. I’m sure all the family including the dog will love it. Good luck with the unpacking! Eek! I’m in Gig Harbor too! We moved here from Texas almost 2 years ago and have loved every minute of it. I know you will too. Seriously the best place ever. A few hidden jems, check out the Harbor General Store (my new favorite for lunch), Paradise Theatre (local plays), For the Love of Spice (a spice and tea shop), Harbor Greens or Main & Vine (best shops for produce), McCormick Forest (great for hiking trails), Sehmel Park (best park in town) and Donkey Creek Park (where you should be able to see salmon spawning right now)….Really everything in this town is pretty great. Congrats!!! Congratulations! I am so happy for you and your family. Can’t wait to see the transformation of this home! Storybook pretty ! Can’t wait to see all the updates ! Congratulations! I’m very happy for you and your family! I’m looking forward to seeing the results of you working your magic! This is a beautiful home! Looks like a storybook house! Can’t wait to see what you do with it! Surely lots of blog content will follow from this! Gina @ Gina Diamond's Flowers Co. So very happy for you and your family. It is truly a great house and I look forward to seeing it with your lovely furnishings and creative touch in all the rooms. Thanks for sharing your exciting news! Congratulations! I am so happy for your family. This home has so much potential. Can’t wait to see all your transformations! Congratulations! Enjoy the minutes as you fill it with love and create happy memories! Beautiful home. The outside is so storybook cottage-like. Can’t wait to see what you do to the inside! Congratulations to your sweet family!!! Such an exciting new season of life for all of you. The pictures of the new house leave me anxious to see what “Emily’s touch” will add to those darling bones! The kitchen pic actually made me say out loud – “Those cabinets are so not Emily!” :) I can’t wait to see where this new adventure takes you! I’m so excited to watch you do this! And I’m going to be scouring every post for lots of details :) We just bought a home as well and are moving in two weeks. We have lots of updating to do and since I love your style I’m sure I’ll love getting some fresh ideas from following along with your updates! This is lovely! I cant wait to see your creativity bloom here. My daughter is a fan of your blog too and she lives in Washington also. We both love your style and excited to see what you will do. Congratulations on your new home!!!! Congratulations! It’s beautiful house and property. It will be a wonderful place to live and raise your family. Can’t wait to see how you make it beautiful inside. The outside is gorgeous. So happy for you and your lovely family. I wish i could move into your old house, it was so awesome. Is wonderful home. I can’t wait to see what you do first! Love your style. Yay, yay, yay!! What a gorgeous place! Can’t wait to see how you put your beautiful and creative touch on it all…congrats! So, so happy for you all! What a dream! This is so exciting. I see so much potential. What a charming property and home. Lots of memories to be made. Congratulations! We just moved too! What an adventure! Gorgeous home. And I can’t help but wonder what you’ll make with all that pretty fence you’re taking down. Creative mind reeling here— So much fun potential I would t know where to start!! Wow! Congratulations– it’s truly perfect! Well I wish the fence was reusable! It is just a aluminum thing that is pretty wobbly. We already removed most of it and will donate it! So happy for you and your family! Thanks for sharing your joy. SOOO excited for you all! What an amazing home with wonderful potential. I can totally see why you bought it. Can’t wait to see what you do to make it your own! Congrats! I actually spend time there a long….time ago…1982 on Fox Island it was an up and coming area back then. Best wishes its a great community! Wow you all must be SO excited!! Your new house is so incredibly charming – I LOVE it!! What a beautiful yard too! Absolutely cannot wait to see the changes you make! May you and your children share many joyful memories in your new house. May you and your children’s children share many joyful memories in this home. I cannot WAIT to see how you add your style to this house! You’re so creative, and such an inspiration. I’ll definitely be following. Love seeing the before photos, what a beautiful property! I don’t think it’s crazy to want a window in your closet! We have one in ours, and it wasn’t really something I had thought about, but I LOVE it. Congrats on your new place! It’s really lovely! Congratulations on our new home! Gigs Harbor is wonderful. Our home is on Bainbridge Island. The northwest is the best place to be. I can’t wait to watch your home evolve as you make it ours. I read this with excitement for you and your family. God is so gracious. Beware of a window in your closet, even with no sunshine Seattle, the light coming in the window will fade your clothes. Wow, Emily this is so charming and looks like a great place to raise your family. Can’t wait to see all the cute, creative touches that you will do. Congratulations to all of your family!!! My best friend lives in Gig Harbor! And I swear you bought a house in her neighborhood. I promise not to stalk! Pinky swear! Beautiful house in a beautiful little town! Congratulations. Congratulations on your beautiful new house, I have no doubt that you will make it YOURS in no time. It’s extremely exciting to be able to put your personal touch on every space, I’m looking forward to seeing your progress in future post. Oh my goodness! It is just so cute! I can’t wait to see what you do with it! Congrats! I love the look of your new home and yard! I hope you all love it too as you change it to make it homey for you! Thanks for this post – never heard of Gig Harbor but it looks gorgeous! So excited for you! Can’t wait to see what you do with it! Beautiful! I kinda really like the layout of the cabinets and the sink in (I think) the mud room/laundry room. I wish years of happy memories and beautiful decor! This is so awesome. We’ve been looking in GH too! Question for you… how did you muster up the courage to move out of a city you were established in? I’m admittedly afraid of having to start over. I know God is faithful, but I’m admittedly afraid of the unknowns… will we make new friends? Will my high school & middle school aged kids thrive away from their lifelong BFFs? I’d love to hear your heart on this! So beautiful! I worked in Gig Harbor when my husband and I were first married ☺ We now live in California, but hope to make our way back to Washington in the near future! How exciting!! I can’t believe you were able to keep quiet about such a huge and awesome project :). I bet your mind is spinning with ideas. Can’t wait to follow along on this. WOW WOW WOW!!! BEAUTIFUL HOUSE!! I can’t wait to see how you decorate! Congratulations! I can’t wait for it to get your stamp and style. Will be so fun to be along for the ride. That house is just too stinking cute! This place is precious and such a great neighborhood. Congratulations. I’m so happy for you and I’m looking forward to your new build out! It will be a fun journey. Thank you for sharing this with everyone! I love your new home!! The outside is so charming! I can’t wait to see the transformation!! I know you will love doing it! Congratulations to you and your beautiful family on your new home. Wishing you all the very best life offers. Oh wow!!!!! You’re homes looks like those movie homes. Just beautiful! Some good friends of ours live in Gig Harbor and own the Gig Harbor Fly Shop. Amazing people! Enjoy your new home, it’s beautiful! You are on my side of the bridge now! Gig Harbor is a great town. I can’t wait to see all the updates you do to this new house, especially that kitchen. Do we need to start a pool for how long till the upper cabinets come down? What a beautiful house and property. I can see why you loved it so much. I can see some walls coming down on that main floor. it will be awesome when you put your personal touches on it. Talk about good bones! The outside is ssssoooo inviting! The inside is so ready for updates and adding your own personal touches. Can’t wait to see the transformation! Totally amazed that it was still available when you got home. Right now in my area, houses are going under contract within 24 hours of being listed. And that is with numerous offers…Happy new house!! I CANNOT BELIEVE how similar this story is to what just happened with us. We just moved very suddenly a couple of months ago. We changed countries in 90 days from the first glimmer of considering the move to closing on the house. We bought our house after seeing it only on FaceTime with our real estate agent because we were on such a tight timeframe to get the kids enrolled their new schools that there was no time to book tickets to actually see it in person. We closed in record time, stayed with friends for a week, then slept on air mattresses in our house and ate sitting on the stairs until our furniture came and spent the day after closing registering for new schools that started 5 days later. We moved from a pretty standard builder’s suburban house with privacy fences and neighbors just feet from us on all sides to a 1.5 acre property with trees (and wildlife!) all around. Our old house was white cabinets we had painted after you inspired us and white trim everywhere inside, but our new one is very similar to yours – oak all over the place, dormers, large space above the garage, tile in the kitchen. I will be watching your blog posts carefully – I am VERY eager to see what you do with the new place!! Wow, what a gorgeous home and property! Can’t wait to see what you do with the inside, I just love your style. Congrats! The new home looks great and Gig Harbor is such a beautiful area to raise your family. I look forward to seeing what you do with the place! I can’t even tell you how much I love this house! Congrats! It’s awesome! The yard is picturesque. What a great house! I am very happy for you and your family. I have been following you for about a year and I love your style. If you ever come to Madrid -Spain- let me know. I would be thrilled to show you around!! Fabulous space! Can’t wait to see what you do with it! And I love the garage 2nd floor office/studio space! Congrats! All the best! So so fun! I may or may not have looked the house up on Redfin – so cute and what a great area! Gig Harbor is one of the few places that I wouldn’t be super mad if God called us there…because Blake’a company is based out of there. We’re down there often! Can’t wait to see the inspiration start flying – congrats! Truly excited for your entire family. It looks like an amazing family home. Looking forward to seeing what your decortating will look like. PS. You must be exhausted. Congratulations on your new home. Its adorable. Looking forward to follow you as you make this your new home! Congrats Emily!! Gig Harbor is such a beautiful town. We loved the Green Turtle restaurant. Your house looks beautiful! I can’t wait to see what you do with it! Hope you and your family can build many happy memories there! So exciting for you! It looks like it’s straight out of a story book! Adorable! Congrats!!!! I can totally seeing this be your home decorated with your amazing touch in no time!!! So much fun to revamp and make amazing memories as your kiddos grow!!! Keep us posted for sure on the journey!! Congratulations! It is lovely and I’m sure with your combined talents, it will soon be a showplace! It will be fun to watch the progress. How exciting!! Congratulations to you all. It will be so exciting to watch how you make it yours. *wow face* What a blessing!!! What a dream!!! Absolutely beautiful! I can’t wait to see what you do with it. Hopefully, the kids will adjust easily, enjoy new friendships and make amazing memories! The yard is so nice and very spacious. Isn’t it exciting to begin a new season of life in such a wonderful way? Congratulations and wishes for happiness and joy every day! Congratulations! It looks wonderful! I look forward to your future posts, hoping you will share your beautiful work of updates. Happy new home sweet home! So, so fun and exciting! This place is lovely already but I cannot wait to see you add your style and personality to it. Thanks for sharing with all of us! Great bones! And with all your talent it won’t be long until it’s spectacular. I was just thinking that I could use a trip to the west coast, and your kids could probably use an extra grandma, so how about I adopt you? Wouldn’t that be fun? We could always use another grandma! Oh my goodness! It’s lovely and I am so excited for your family! I’m so excited to see the process of making it into your home! Oh my goodness! First, a family adventure of a life-time… now, creating a spacious home for your growing family! Can’t wait to follow along on your adventure of putting your design touch in your new place! Congrats! I love your house! So perfect! So excited to see what you do with it! I know it will be fantastic! That would make a great post. I’ll do my best! It’s beautiful, congratulations!! The only local blogger I read just got closer. ;) I grew up in north Tacoma and have many friends in Gig Harbor but we live in Auburn now. Your outside foggy pictures look great – so cozy. Fall is my favorite season! Congrats again! It looks beautiful, congratulations!! The only local blogger I read just got closer! I grew up in Tacoma, and have many friends in Gig Harbor but we live in Auburn. :) The foggy pictures look beautiful and cozy. Fall is my favorite season. Congrats again! Oops, I didn’t see my earlier comment, so I wrote it again. Sorry! So exciting! I look forward to watching you bring your talented eye to this space. I. die! That house is SO gorgeous! My husband and I are in the midst of house hunting and we are separated until we buy and move in (horrible decision on our part, especially with two little ones). I can’t wait until you get it all decorated and am anticipating amazing posts from you as y’all work on it. YAY! Congratulations! Very nice house and yard. I have heard that Gig Harbor is a very cool place. Glad it worked out. Following you is such joy! I bet this will become just like Nora Murphy’s Connecticut County House only on the opposite coast and in Gig Harbor. For those of us who love design, family and projects…well, there is just no end in sight now is there??? It will be a long road :) I hope I don’t bore you all! Thank you! This house is going to make for great before + afters! congratulations! what a great new adventure. this has been a busy year for y’all, but full of so many good things. Yay!! So excited for you! It looks beautiful. I’m also a little bit excited that it was built in the same year as the house we bought 2-1/2 years ago so that maybe I’ll get some more inspiration from what you do to yours! We’ve just been living in it for awhile to see what we really want to do/spend money on changing. Good luck in your process! We can’t wait to tackle some easy projects and have bigger plans for later. I hope it will help with your decisions in your home! Congratulations! So happy for your family!, You are right the house has good bones. Although, that yard and the trees are priceless. I’m looking forward to what you are going to do to this house. You have great taste and I know it will look Gorgeous! Nice! You and your family are going to have fun, fun, fun! I LOVE homes like this and have always kept my eyes open…lucky you for finding MY dream…can’t wait to watch any renovations! Congratulations. Goosebumps! Love the architecture and gardens, but kind of sad the picket fence won’t work. It’s perfect, IMO. ? It is cute from afar, but it is one of those aluminum ones that is very wobbly. Congratulations on your new home! I wish you many years of happy memory making. What a fabulous garden for your family to “grow up” in!! What a beautiful new home. Can’t wait to see all the great things you’re going to do to it!! Thank you for sharing! That is exactly the house I would have picked :) it’s lovely. You will have many special memories there. Congrats! I wish I didn’t live on the other side of the country. I would love to help you paint the rooms. LOL Can’t wait to see the IG and blog posts! I’m just now realizing how connected I feel to you through reading your blog when my eyes welled with tears for you! I’m genuinely happy for you guys–the outside is ADORABLE and you’re going to have the inside totally “you” in no time!! :D Congrats!!! That is the sweetest thing! Thank you for being so thoughtful! Stacy, I had the same reaction. It was if my sister was telling me about this new house they were moving into. I found myself thinking, ewe what would make a great house warming gift. Emily has such a wonderful way of bring us all into her life. Thank you, Robbie! This is such a kind comment! Congrats!!!!! So very exciting! Can’t wait to see how this space is transformed to your style for your family! We’re in for a treat as you revamp your new house. I’m in love with that double sink. I might be shedding a few tears over your old house. You are the fourth blogger, i follow, to being in the process of changing homes. We have shed a few tears leaving behind our old house, too. We were there for 10 years and have so many memories. It goes on the market tomorrow and I’m hoping that a new family will enjoy it for years to come. Congrats! I live just over the bridge in University Place and wondered why you were in Gig Harbor for a few of your pics/posts. What a great place! So happy for you all! It’s been so hard trying to keep up on instagram without giving away what’s going on. Hi from the other side! Welcome to Gig Harbor! I’m so excited you and your family found a wonderful home here. You will love the area. It is sort of small town-isa but has most of what you need. It is a great place to raise children.We have enjoyed living here for 12 years. I have been following your posts for awhile now, and am so happy for you and your sweet family. Hope some day I will run into you and tell you in person how much I love all the great ideas you share…. I’m at harbor greens all the time :) Please do say hi! Congratulations! What a blessing!!!! Enjoy the adventure of creating new memories in this beautiful environment. It’s lovely! Can’t wait to see all your renos! Wow! What a beautiful home and yard. So excited to see how you’ll make it yours. ? So happy for the Lex family! Know the new house will provide many happy years for all of you. Congratulations Emily! It is a darling house! Gorgeous! Hello dream home! I can’t wait to see what you guys do with the inside! So exciting, congratulations to you all!! The house has a great layout, can’t wait to see you transform it with your personal style and creativity. You will do great things there as a family. Enjoy every minute in your new home! What a gorgeous setting, and I love how neutral the exterior is! I know it will be stunning! Ahhh I’m so excited for you guys!!!! Can’t wait to see how you pretty it all up and how it changes over time!!! We have so many ideas and can’t wait to get started! What a beautiful home. Congratulations! So excited to share this exciting journey with you! I can’t wait to hear what your first project will be! The Kitchen? Painting all the rooms white? Will you move in right away and work on it while you live there or stay of property to get some of the work done? Very excited for you, congratulations! We’re moved in :) Ish. Our furniture is still in our old house used for staging while we sell it. Then we’ll move it all over. So for now, we’re sleeping on air mattresses and eating from camp chairs. The first projects? I’ll share more this week! Congratulations! It’s beautiful! I, too, look forward to seeing how you & Ryan will transform this place into your home. You both are a very creative and talented couple. I definitely like your style. Congratulations again!!! Thanks for sharing God’s blessing! Makes me think of Proverbs 3:5-6. Thank you! We do feel blessed by this and can’t wait to share it with others. That is so exciting! My aunt and uncle live in Gig Harbor and it is such a beautiful place! The house is darling and I can’t wait to see what you do to make it your own. Wow, congrats! I can’t WAIT to see how you make it your own. Best of luck unpacking and getting settled! How exciting! I look forward to seeing how you put your unique stamp on it. We’re planning to start house-hunting very soon and I am filled with both elation and dread. It’s amazing! I can’t wait to see what you do with it! Congratulations! You will love Gig Harbor and I know some people that are probably very Happy to have you so close! Congrats!!! Congratulations! So….please don’t leave out the story of the sale of your previous home?? Did it sell quick? So happy for you and your sweet family! It goes on the market tomorrow. Wish us luck for a quick sale! I’ll give details, for sure. Congratulations, I have so enjoyed watching you transform you other house…I can’t wait to see what you do to this one. How very exciting!! What a lovely house and in such a beautiful setting. Sooo excited for you and your family!!! I can’t wait to see how it progresses into your style!! Your new office space is dreamy or at least it will be. Having space is important for creatives. Cheers. Congratulations! I cannot wait to see what you do to this place. My family and I just moved into a similar house and the same finishes. I’m being challenged everyday with trying to find ways to bring out my personality but also not painting all the trim and windows or demoing any rooms because well there really isn’t any place to demo. It’s all cosmetic! So excited to follow your journey! Same! I’m super conflicted about our trim because some rooms look beautiful with the wood trim and doors and others are just crying for it to be painted white and I’m not sure what to do. Good luck to you! Wow! Congratulations on your new home. A beautiful house in beautiful surroundings. Congratulations! It’s beautiful. Many Many years of making beautiful memories in your new home. Congratulations! God is good! That house will be such a great place to grow up!!! Congratulations and welcome to Gig Harbor!! I’ve been following your blog for years — so much inspiration. I’ve used your gift tags for my homemade jam for several years too. Can’t believe you are now living in our lil’ town! I’m sure we are just only a few minutes from each other. I hope your kids are enjoying their new schools. We do love this area! Can’t wait to see your home transform! New Home New Ideas! Congratulations – It is just lovely and I am sure will be even lovelier when you get your creative spirit infused into it. Oh wow, this property and house are beautiful! I cannot wait to follow along with you as you make it your own. I’ve been following along with Melissa at The Inspired Room (whom I’m sure you know also lives in the Seattle area) and it’s been such an inspirational journey. And I know yours will be too! I love your style and simplicity and again, can’t wait to see what you do!! Congratulations!! So happy for you and your family. Many blessings to you on your new adventure. Praying your move and transitioning is smooth. May the Lord fill your heart and spirit with peace. That is so sweet. I loved that house and we had such a good time making it our own. We hope to do the same here and hopefully you’ll fall in love with this one, too. Congratulations! What a beautiful home! God’s timing is so good! I can’t wait to see what you do with it. What a beautiful house. I can barely wait to see what you do with this canvas! What a lovely home and I can just see the potential with your sense of style. Enjoy and make many happy memories in your new home. I’m sooo excited, and admittedly a bit jealous, for you. How fun! A whole new space for you to transform. I’m sure your head is racing trying to determine which project will come first while secretly still constantly working the others in your head. The house has great bones and fabulous curb appeal and while completely livable for most I’m sure you are just itching to jump in, tear it up, paint it up, and make it spectacular!!! Congrats!!!! I’m so excited for you guys! But, of all I’m excited to see the transformation! Oh my goodness..love it! And now you live so close to me (well, in my mind..I live on Bainbridge)..I’ve been following your blog for several years, and love, love, love your style, ideas, and family! Congratulations! I can’t wait to see how you transform your house! You are such an inspiration! Bainbridge was high on our list of places. We put in an offer last spring and didn’t get it – then we would have really been neighbors! I bet you’ll love it there! We have friends that have a waterfront home in Gig Harbor. Wishing you God’s best for your new adventure/home. What a beautiful place! I can’t wait to see what you do with the interior. Congratulations!!! I am amazed at your discipline to keep this news under wraps because it is so exciting! :) Can’t wait to see all of the amazing ways you guys make this house your own! Congratulations from across the state (Spokane)! I love Gig Harbor and I can’t wait to see how you transform your new home! I love your new house! I can’t wait to see all that you do to it! How exciting! Can’t wait to see what you guys create there. It’s adorable!!! Sounds like it was totally meant to be- congrats! How exciting! Congrats! It’s beautiful! Wow! What a beautiful property and house! I see the potential throughout it! Oddly enough, we’re looking for a new home with many of the same requirements. I was about to cave and take something that didn’t necessarily fit our wish list but would at least get us into something where we’re not renting. You’ve inspired me to wait on “THE HOUSE” for us! I can’t wait to see where you take it!! Do wait! The right thing will come. And it may take some imagination and willingness to let some things go, but there is a good one out there for you! It’s darling!!! Can’t wait to see what y’all do with it! Oh my gosh, congrats, such an adorable house, Emily! We just moved the beginning of June into our first house (nothing but rentals for the first 5 years we were married since we were in the military) and your post about making your builder grade house into a home over the years helped calm the panic in my chest to make a to do list of what needed changed pronto and how much that would cost! I can’t wait to see what you do with this house and would love to know if you get the same “WE NEED TO CHANGE THIS NOW BECAUSE I NEED PRETTY” mentality that I’m hoping I’m not alone in having. Being a visual, creative type is sometimes more an expensive curse than a blessing! Oh, I feel it! I am so tempted to just tear it all out … but we know the time will come. It will take patience! OhMyGosh i can feel your excitement! Congratulations! Can’t wait to see what you do to make this yours! I love it already. Congratulations! So, so fun for your family (and for us as we hang out with you)! Beautiful! So much potential! I love Gig Harbor it is totally one of my dream areas! Hope you enjoy your new home! I’m super excited to see what you do with it! Love it!!! Can’t wait to follow along as you make it your own! Yay! It’s so awesome! The outside is so charming. I love Gig Harbor. And you aren’t too far from us so yay for that! I was wondering if your world’s would collide now. I’m a long time reader of both your blogs, and as an East Coast Washington, D.C. girl, I have no idea how big your area is, but I’ve been following along waiting for YOUR kitchen reveal! Now my two favorite blogs, new houses, what shall I do! I can’t wait! Aww so wonderful! I have been reading your blog for so long now and have been truly inspired at the way you’ve turned your “builder-grade” home into something so special! Can’t wait to see this house…and the property is just amazing! So I’m curious if you will decorate this house in a very similar manner as your old house currently is, or if you feel like there will be significant changes. Always fun to see what designers do in different houses! All the best to you! And thanks for still blogging. I love reading it! Congratulations! What a fun new adventure! Can’t wait to follow along in the designing process! What a great house with great potential to make it your own. I can’t wait to see you put your own touch on it! This house is adorable and I can only imagine how fabulous you are going to make it! I’ve been reading your blog for years and always thought, if she lived in Gig Harbor, I know we’d be friends! ;) I grew up there and moved back there with my little family a few years ago, but just recently moved out of state. Darn! ;) You are going to love it! Enjoy this new adventure. Congratulations Emily! It is a gorgeous home, and I know in no time you will have put your special touch on it. Congratulations! It is really beautiful. I’m looking forward to seeing how you make it your own! Congrats!!!!! What an exciting adventure! I am so happy for your family. Congrats! I have been a long-time reader of your blog but never comment. I am SO EXCITED for your family (and all the fun reno plans & dreams for you and Ryan). We too have four children, four boys ranging in age from 10 to 19 now, but we built a new home on a rural lot 10 years ago to allow more room to play and grow for our boys. We are currently building another house (I guess we have a 10 year itch or something;-) ) and I love your design inspiration as I have used your pins and blog to help design our new house. I am so excited to move in in six weeks – we are at the drywall stage right now! I would love to blog about the whole process and enroll in your blog course but life seems way to full right now to be able to fit that in as well. I hope to do that in the future, maybe enroll in your course this winter after we have moved and then blog about it with that 20/20 hindsight perspective. Thanks for sharing your design inspiration and family life – I enjoy it all! Mamas of four are special for sure. Yum. We just had brunch there last weekend. It was amazing! Congratulations on your new home. May you create many happy memories there! It is SO charming! Can’t wait to see how it transforms into your own. Congratulations!! How exciting! I’m looking forward to seeing how you transform your new home. So Exciting! Can’t wait to see this house become your home! Congratulations Emily, Ryan and family!!! What an exciting way to end a spectacular vacation. I can’t wait to see the transformation as you make this house your new Home!!! Congrats, Emily & Ryan!!! So excited for you! I cannot wait to see what you guys do! Can I guess there is some serious cabinet painting in your future? Would love to see a “plans or wish list” post. Oh, that post is coming! Wow, it’s beautiful, can’t wait to see you put your personal touch on it! It seems so perfect. That yard is to die for! Love, love, love! What a perfectly charming house! Sounds like it was totally meant to be.. I will enjoy seeing the transformation of some of the spaces. Best of luck to you and your family as you settle in, and make this house your home! Congratulations. I hope you sell your other home quickly … or did you say you already sold it? What kind of work does Ryan do, by the way? I thought I remembered from a post a long time ago that he was a fireman? Looking forward to seeing how you make this house your own. It definitely needs updating inside! The outside is charming, with a lovely yard. Enjoy your new home, new town and the renovation process! I hope our old house sells quickly as well! Ryan retired from the fire service at the beginning of the year and works full time with me on our businesses. We are excited for this new season with so many changes! Congratulations! What a great house! Beautiful curb appeal and great spacious layout. Can’t wait to see all the touches you put on it to you make it yours! So exciting! Congratulations! I can’t wait to see how you turn this into your home!